Associated Press Jeff Collins, owner of Ace Music, has unknowingly been breaking the law by selling pinball machines in Kokomo. 'KOKOMO – At their height, the pings and bells of pinball machines could be heard in arcades and pizza parlors across Kokomo, offering an afternoon escape for teenagers and a consistently profitable investment for store owners. Unbeknownst to the two groups, their actions were illegal. 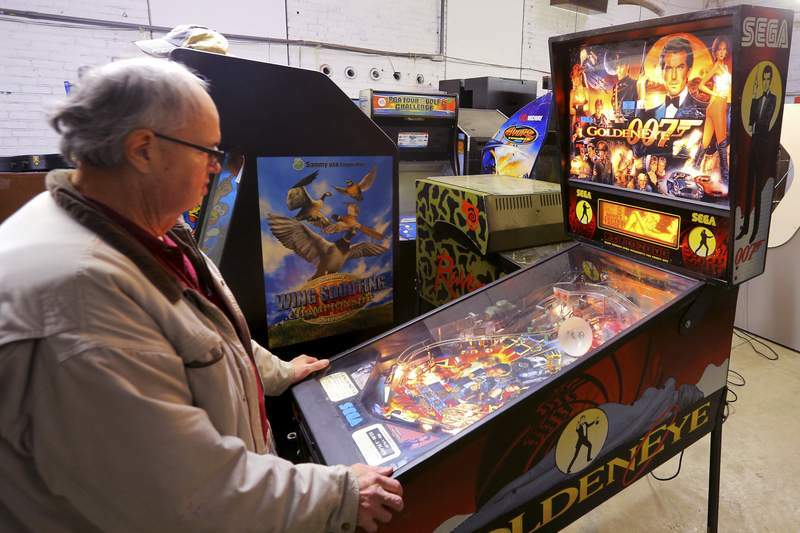 A recent city ordinance, passed on first reading last week by the Common Council, looks to reverse an arcane, unenforced law that has prohibited pinball machines in Kokomo. In fact, it was deemed "unlawful for any person to operate, permit to be operated, or permit to be offered or available for operation, any pinball machine," as written in city records. It’s now the council’s intention to repeal the "outdated" ban, likely by Monday. "There are, not just locally but even nationally and statewide, laws out there that have been on the books for years that are silly, are outdated, are no long relevant," said council member Steve Whikehart, who is sponsoring the ordinance. Whikehart said that despite the peculiarity of passing an ordinance to legalize pinball, it is the council’s focus to eliminate unnecessary and inefficient city codes, effectively modernizing the city’s laws. While this year’s pinball ordinance states that the original prohibition was codified in 1975, it is possible the ban could stretch back to 1955. A story titled "City Council Outlaws Pinball Machines" published in the Kokomo Tribune on July 26, 1955, outlines the reasons for the ban, which was approved unanimously by that year’s city council. The ordinance gave the Kokomo Police Department the power to impound any machines still operating. At the time, the possible punishment to own or operate a pinball machine was a fine of up to $300 and six months in jail. There were reportedly an estimated 103 licensed pinball machines throughout the city. The mayor in 1955, Raymon Gilbert, told the council that pinball machines, which he said were used as gambling devices, were the only such "games of chance" licensed by the city. In that ordinance, pinball machines were called "devices for gaming," payments being made "such that local police enforcement tends to be defeated." As written in the story, "The mechanism, it states, tend against peace and good order, encourage vice and immorality and constitute a nuisance." An editorial published the same day commended city council members for passing the ordinance, stating that, "Wives whose husbands have gambled away their entire pay checks on pinballs have complained against the devices." It even states that one poolroom operator was arrested on a charge of keeping a gambling device after paying off two plain-clothes state troopers for a "hit" on one of the machines. "The ordinance now gives the police department the weapon with which to stamp out one of the worst forms of modern-day gambling. It is a move welcomed in this community," read the editorial. The ordinance was later upheld in court by Superior Court Judge Gerald Rybold in September 1956 after a challenge by Robert Musselman, who filed a restraining order against the city, calling the anti-pinball ordinance unconstitutional. It was reported that Musselman owned 35 to 40 pinball machines used in taverns, poolrooms and clubs across the city. An article published in October 1981, though, states that the pinball ban and an accompanying ordinance requiring "amusement machine" owners to pay a license fee were not taken seriously for 23 years, until 1978. At that time, the city decided to look for untapped sources of income, and began collecting license fees for amusement machines, or arcade games. The decision was quickly fought with a lawsuit filed by a number of amusement companies. Included was Jeff Collins, owner of Ace Music, who remembers having to, for a time, pay the city $50 to move or rotate arcade games. He can’t believe, however, what he is now hearing about pinball machines. While Collins still owns a copy of the July 26, 1955, paper about the initial ban, he was under the impression it had long ago been lifted. When asked whether he found the fact that he’d technically been breaking the law for decades funny, he laughed and said, "I guess so. So has everybody else who’s been playing them. So has everybody else that’s got one, and man, I’ve sold a lot of pinball machines in Kokomo." Collins continued to address the surreal situation, questioning the idea that the game can be construed as gambling. "It is sort of weird that I’ve been breaking the law all these years and gotten away with it," he said. "I guess it is weird. The police didn’t even know it; the city didn’t even know it." Collins did bemoan the fact that pinball machines have fallen by the wayside, saying they’re now too expensive for average people or businesses to buy. For Whikehart, the situation has brought some levity to the often serious job of being a city council member. He said the ordinance became a topic of conversation with his in-laws at Thanksgiving, when he joked that "my legacy will be the legality of pinball machines, to where they can have them in Kokomo again." Whikehart, who said he’s talked to people around the community who are shocked by the law’s existence, noted that as a kid that he remembers playing pinball at Noble Roman’s and Aladdin’s Castle, and "never knew this entire time I’d been violating local law."